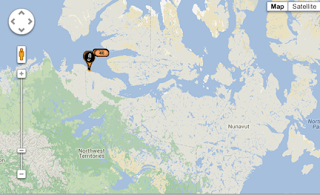 The rowers that I have been watching as they seek to traverse the Northwest Passage are currently making good progress and have just crossed from the Northwest Territories into Nunavut. Figure 1. Position of the Arctic Joule on Saturday evening, August 10, 2013. What I had not realized is that they are not alone in this sort of venture. Coming just behind them now is a Norseboat, Fairmont’s Passion, in which just two men are using both oars and sail to try roughly the same passage. At present they appear to be less than 30 miles apart, with the laggard moving a little faster at present, due to the wind. 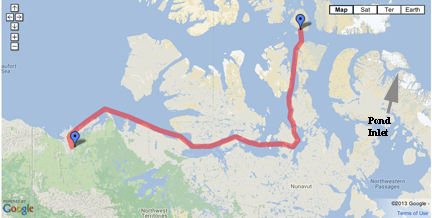 The ultimate path of the Beyond the Circle team ends in Resolute rather than Pond Inlet, so it is a shorter trip, but already one with some adventure. Figure 3. Beyond the Circle Route. The adventure came last Sunday when the boat entered Amundsen Bay and encountered stiff winds and pack ice. At that point they met the yacht “Anna” which was sailing from Alaska to Greenland, having made the reverse trip several years ago. After meeting yet a fourth boat, this one going the other way that warned of ice, Anna and Fairmont’s Passion struggled through that ice in Franklin Bay while sailing through a thick fog. 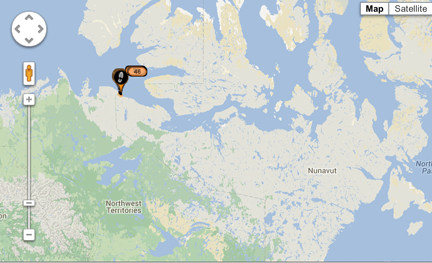 They are now out of the ice, and enjoying beautiful weather, making 30 miles in the last day. Let’s hope that they have good fortune! Thanks for this giveaway opportunity and congrats on your 100th post! I love surprises! Dịch vụ kế toán ACB chuyên cung cấp Dich vu ke toan trọn gói uy tín chuyên nghiêp giá rẻ nhất tại HCM và các tỉnh lân cận với chi phí bỏ ra từ 500.000-1.500.000đ. Liên hệ: Dịch vụ kế toán , Dich vu ke toan.